Compare to a few Yongzheng dishes with this decoration, one in the Metropolitan Museum of Art, New York, illustrated by S. Valenstein, A Handbook of Chinese Ceramics, New York, 1989, pl. 248; one in the Tokyo National Museum, illustrated in Oriental Ceramics, Kodansha Series, vol. 1, Tokyo, fig. 160; one published by R. Krahl, Chinese Ceramics from the Meiyintang Collection, London, 1994, vol. 2, no. 843; one in the Chang Foundation, Taiwan, illustrated in Chinese Ceramics from Han to Qing Dynasties, Taiwan, 1990, pl. 127; one included in the Min Chiu Society exhibition, Splendour of the Qing Dynasty, Hong Kong Museum of Art, 1992, Catalogue no. 133, and subsequently sold in these Rooms, 2 November 1999, lot 584; and another, also sold in these Rooms, The Imperial Sale, 28 April 1996, lot 54. 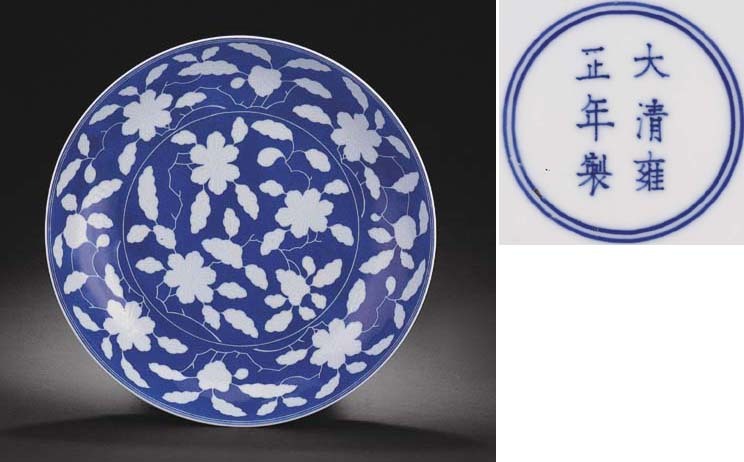 For the Ming prototype of this dish, see the reverse-decorated dish from the Xuande period with fruits and flowers, included in the Special Exhibition of Ming Xuande Ceramics, National Palace Museum, Taiwan, 1980, Catalogue no. 82.